These savory pancakes made with shredded potatoes or other vegetables are common in many cuisines. 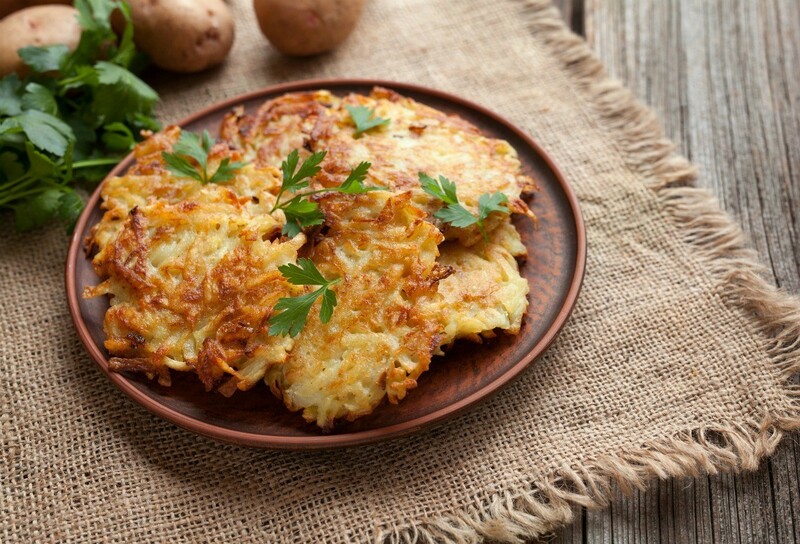 Jewish latkes are traditionally served with applesauce and sour cream. This is a guide about making latkes. They are traditional and healthy at the same time. Boil cauliflower and drain - mash well. Boil spinach and drain. Mix with mashed cauliflower. Add 2 grated onions, 3 eggs, matzoh meal, and spices. Heat olive oil until very hot. Cook latkes about 4 minutes on each side and then bake at 400 degrees F for half an hour before serving. Instead of messing up the kitchen making latkes, try the Baby Cakes by McCain. I purchased them at Target, in the frozen potato section. Yummy! The family loved them and I didn't spend hours grating potatoes, wringing out the moisture, and then messing up the stove top by frying. Although I usually do this chore outdoors on the patio, it's still a big greasy, spattered mess by the time I get through and I always say to myself that there has to be a better way to do this. I found the better way! Baby Cakes by McCain! I served them with my home made applesauce. Take a few different varieties of unpeeled apples, remove the cores, cut into wedges, add 2 cups of water, a sprinkling of cinnamon, put the lid on the pot and simmer, stirring occasionally, until it looks like a rough applesauce. This takes about a half hour or longer depending on the quantity of apples. If it's too watery, just raise the stove temperature on the apples with the lid off and boil off the excess liquid for a few minutes, stirring occasionally. The potato information: McCain Home Style Baby Cakes, /www.mccainusaretail.com, UPC 0 7271403969 0, phone 1-877-804-6198. It also has the kosher U symbol. I served them for dinner tonight and before DH even got to taste one, he was asking me to serve them at least 4 times per year (he knows how messy it gets). When he tasted them, he asked for them more often, considering all I had to do was take them out of the package and bake them for a short while in the oven. Usually, everything is pretty much homemade in this house, but these are definitely going to be the exception. I have also had their, "Smiles", potatoes shaped into smile shapes. Very good.